Let’s start with the over-the-top New York Yankees payroll (always fun). 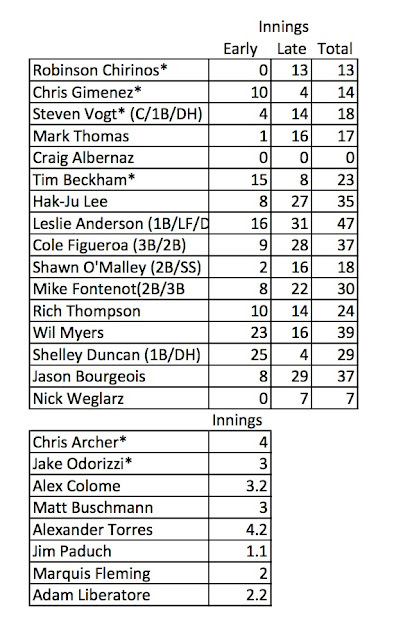 Rays Index points out that the salaries of three Yankees now on the injured list (That would be Mark Teixeira, Curtis Granderson, and Alex Rodriguez) add up to more than all of the Tampa Bay Rays roster ($65.5 mil vs. $61.3 mil). A commenter notes that the starting first baseman for the 2013 Yankees could be … Dan Johnson! Thanks to Adam Sobsey’s twitter feed we learned that the numbers have been crunched for minor league ballparks. DBAP looks to be pretty much middle of the pack. MLB Trade Rumors has relooked the Garza trade of a couple of years ago. A lot of players from that trade have shown up in Bulls’ uniforms and more likely to show up this year. DRaysBay is looking at prospects, and most of these guys could start out in Durham in 2013. Pitcher Jim Paduch is among the first to be sent down to minor league camp. “Down” probably isn’t quite the right word. In Port Charlotte means cleaning out one locker, walking about 100 yards and filing up a new locker. Rays Index has updated his playing time chart. I’ve broken out players I’m watching in a separate table.